There were many topics covered and the presenters did an outstanding job of sharing their expertise. If you’d like to view video recordings of any of the short talk sessions the content is freely available on the website. Additional information provided by a number of speakers, including copies of presentations slides and relevant links, can be accessed from the Camp Speakers web page. VALA – Libraries, Technology and the Future, Inc, together with our Tech Partner, AARNet, invites you to the inaugural Australian gathering of technologists who work for and with libraries, galleries, archives and museums at the William Angliss Conference Centre 12 – 14 July 2017. Comprising 2 full days of 1-hour workshops, 20-minute short talks and assorted ‘Hacky Hour’ sessions, Tech Camp 2017 will be an intensive, active, hands-on learning and sharing experience run for and by the people who code, build, teach and maintain technology for libraries and collections. Book your ticket, mark your diaries and come GLAMping in 2017. 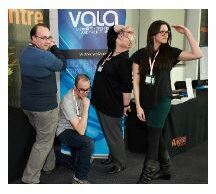 Talk it up on #VALATechCamp. A mission AARNet shares with the VALA GLAM IT crowd is to enable the take up of new technologies in research, education and culture. AARNet (Australia’s Academic Research and Education Network) delivers a high speed network to universities, cultural institutions, schools and hospitals, that is linked into the world’s research and education networks. AARNet supports education across the life-long learning spectrum and research across diverse disciplines by providing tools and services that enable knowledge creation and innovation, and is delighted to be the technology sponsor for the inaugural VALA Tech Camp. VALA and Linux Australia recognise that regional, rural and indigenous members of the Library community face additional barriers to participation in both library and technical events. The Diversity Scholarship reflects our shared commitment to supporting diversity of participation in open technologies, and is offered to individuals who in normal circumstances would not generally attend this type of event or would struggle to attend due to financial or other hardship. VALA is delighted to announce a NEW Day 0 program for Tech Camp 2017, made possible by our PD Partner, EBSCO and supported by our Tech Partner, AARNet.